A chicory (Cichorium intybus) is a vegetable. It consists of leaves and buds which are edible when they are tender. Its leaves are bright green or red and white in other varieties. Red chicory has red and white leaves. Chicories have a bitter taste, like artichokes. As an energy source, 100 grams of chicory give us 23 kcal. – Minerals in chicory: It is a vegetable rich in calcium, potassium and magnesium, but it also has small amounts of other minerals such as sodium, iron, phosphorus, copper, manganese and zinc. – Vitamins in chicory: Considering its vitamins, it is rich in vitamin A, vitamin C, vitamin E, vitamin B5 and B9 among other B vitamins. 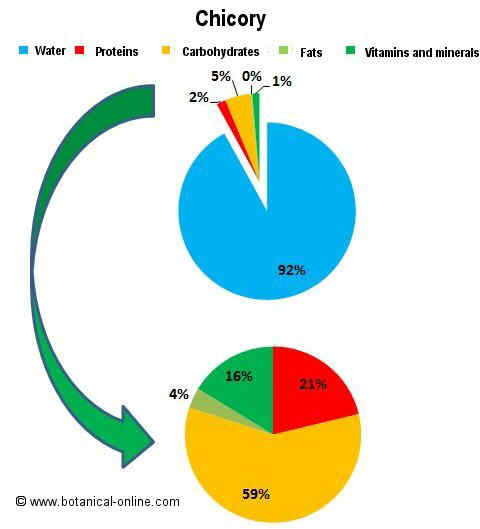 Chicory has a very high water content which prevents us to become dehydrated. It provides little energy, something that help us not to get fat. It contains very little fat. It is low in sugars. It has a good fiber content. Its calcium content together with phosphorus, maintains the balance of the formation of strong bones. Because of its vitamin B5 content, it helps us to get energy for our body to function properly and in conjunction with vitamin B9, it help us to grow properly. It protects our skin and helps us to keep it healthy, because it contains vitamin A. It protects us from colds and helps us to heal our wounds, because it contains vitamin C.
It protects us from the toxins and aging, because it contains vitamin A, C, E and the mineral zinc. 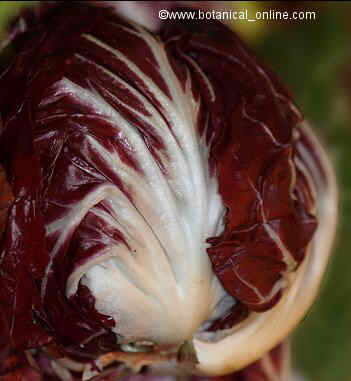 *Related information: Expand your knowledge about chicory.